Introduction: Laparoscopic sleeve gastrectomy may be performed using bare stapler loads or tissue reinforcement strips, with or without oversewing. Many tissue reinforcement strips are after-market add-on products that may be time-consuming to fit onto a stapler. The Duet TRS system by Autosuture affords a single use loading unit in both 3.5 and 4.8mm stapler loads, with integrated strips of absorbable synthetic material. 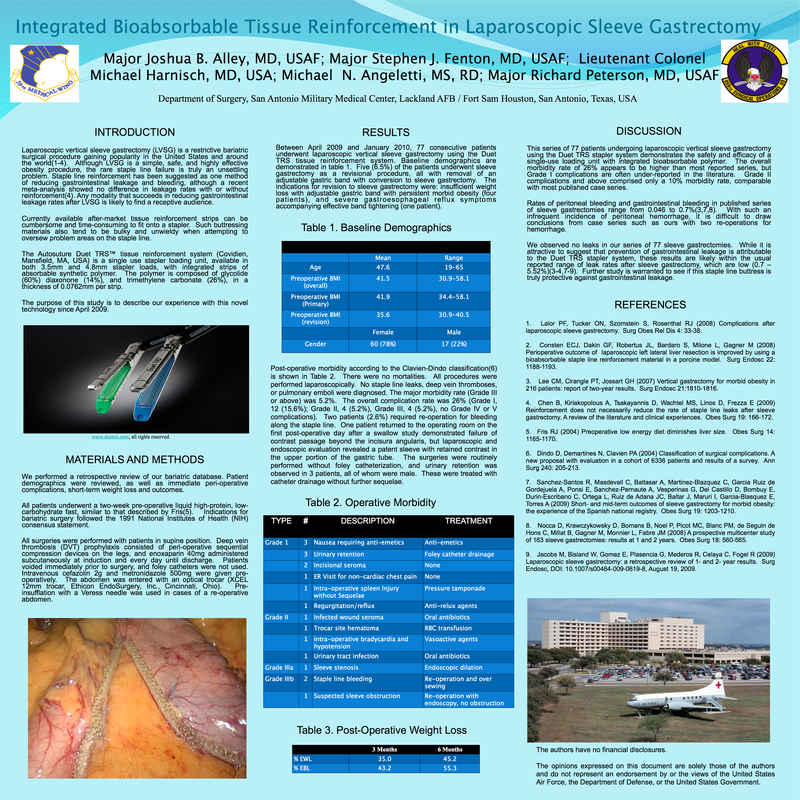 Methods: A retrospective review was conducted of 44 consecutive patients undergoing laparoscopic sleeve gastrectomy using the Duet TRS stapling system. Morbidity and short-term outcomes were documented. Mean follow-up was 1.5 months (0-4 months). Nine males (20.5%) and 35 females (79.5%) were included, with a mean age of 48.4 (range, 19-64). Mean preoperative body mass index was 41.7 (range, 34.5-53.5). Results: There were no clinical leaks, no postoperative bleeding, and no strictures noted in our series, with short-term followup. Two patients underwent sleeve gastrectomy after removal of an adjustable gastric band. The complication rate was 11.4%. One patient returned to the operating room on the first postoperative day for suspected obstruction. There were 3 episodes of urinary retention and 1 urinary tract infection. There were no major morbidities. Conclusions: The use of an integrated absorbable synthetic polymer appears to be safe and may yield benefits of reduced bleeding and leak rates.